The C-Zero has a top speed of 130km/h. 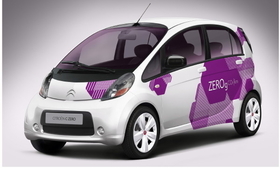 Citroen said today it will launch an electric city car called the C-Zero starting late 2010. The car will be a sister model to Peugeot's iOn electric car, which was unveiled at the Frankfurt auto show in September and will go on sale around the same time as Citroen's variant. Both cars are based on the Mitsubishi i-MiEV. The four-seat C-Zero has an electric motor that delivers 47kW or 64hp and is powered by a 330-volt lithium-ion battery system with 88 cells mounted in the center of the car. The car's battery system can be fully charged from a domestic power outlet in six hours or up to 80 percent of its charge in 30 minutes. Citroen said the C-Zero drives like a regular car with an automatic gearbox. The traditional fuel gauge is replaced by a battery charge indicator. The car's compact exterior dimensions at 3480mm long and its 9-meter turning circle make it suitable for city traffic, Citroen said. The car has a 166-liter capacity trunk and a top speed of 130km/h (80mph) and a range of around 130km (80 miles). 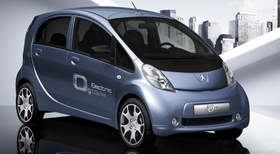 Peugeot will launch the iOn at the same time as the C-Zero.